Musa’s political and cultural topical paintings on fabric reflect his deep immersion in the history of European art (Doctorate in Art, Université de Montpellier). He employs a diversified mix of richly colourful collages of biblical figures, Italian renaissance religious iconography, mid-19th century impressionism and naturalism, and progressive modern pop art and slogans. Throughout the collection, one is engaged by a hybrid of Musa’s multicultural identity and his personal perspective on European image making. The European practice, to Musa, also encompasses an “applied gleaning” of Chinese watercolours and calligraphy indigenous to North-east Africa and the Middle East. The ‘Chicken Conspiracy’ of the exhibition title and the name of one of the recent paintings exhibited on fabric, symbolises the struggles of artists of Musa’s generation as they came to grips with the assimilation of Africa’s local and regional cultural diversities into a new genre of Western-imposed and market-driven global African art. 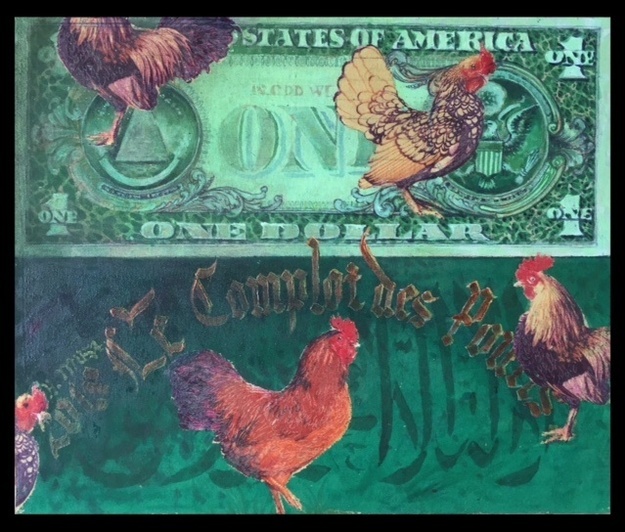 In “Le Complot des Poules, (2018), the economically disadvantaged and their artistic brethren are depicted as chickens controlled by the standards of the global marketplace and quest for the almighty Dollar.